Our company is looking into developing social media guidelines for our employees. I'm on the committee that will be looking at developing this policy. I'm glad I was selected to help out with this effort because I think I bring a much different perspective to the table then the rest of the group. As a millennial and someone who eats, sleeps, and breathes my life on the Internet, I believe in providing employees with guidelines and tips, but also trusting employees to make the right decisions -- and if they don't, then they are coached or 'dealt with'. My belief is that if you educate employees and provide them with guidelines, they won't be stupid. If you think your employees are stupid and careless, then something is wrong with your communications or your employee selection process. I often question my online behavior and the way it reflects on me at work. For example, I always second guess myself when I blog or post pictures because I wonder if someone I work with will see it and form an unnecessary opinion about me. At the same time, I think that I'm allowed to have a personal blog with personal opinions. I never speak on behalf of my company or say my views are my company's views. But I know there are people out there who see a picture of me holding a beer (and there's probably quite a few of those mind you) and automatically think I'm this young kid who 'parties'. If I see a picture of a co-worker online, holding a beer, maybe from a Christmas party or tailgating at a football game, I don't think anything. I just don't judge people on what they do outside of work. If a co-worker connects with me on a social network, it's a social agreement that we will not judge or 'tell on' each other. I think it's a shame when you have to 'unfriend' a co-worker because you can't trust them to not judge you. When I see a co-worker post a political view that I don't agree with, I might have a healthy debate with them, but at the end of the day it doesn't sway my opinion about them as a professional or co-worker. I actually think that getting to know my co-workers on a more personal level has enhanced our work relationships. We're all human after all -- and what's wrong with working hard and then playing hard? At the end of the day if I'm a high performer who consistently has my work done and then some, why is it wrong that I go to a Clemson game and drink some beers with my old friends and blow off all the stress of the work week? I think it's an old mindset that will slowly fade once the newer generations start populating the work force. Don't get me wrong though. I agree there's things you shouldn't post online - some people are stupid. The whole saying of don't post something you wouldn't want your mother to see is a good guideline to go by. My mom reads my blog and looks at all my pictures I post online - she's only once sent me one picture she didn't like, and I promptly took it down. The subject line of the email was, "Future CEO?". I also think that employers need to go ahead and accept that you cannot control employees use of social media, especially the younger generations coming in, so you might as well embrace it and educate employees on what's proper and what isn't (aka what is stupid to do online). And if an employee spends all day blogging or on Facebook, my guess is that this would show in their performance (aka the work isn't done) and it's a management issue, not an IT issue. You tell employees they can't go on Facebook at work, then they will just sit in each other's cubes and talk all day or find some other distraction. I just think forcing employees into a box with technology is such an 'old school' way of thinking. Anyways, I did some research online looking for examples of guidelines and policies. Everything I found was scattered across the Web, so I've compiled a list here to help others who are researching for benchmarking purposes as well. Update: My manager created a handy comparison table that we used when planning our guidelines. You can find my recent blog post about it here. Update (04/22/09): Nathan Gilliatt created a Delicious page for social media policy related links. I found this because this blog post is in his list. Great resource of additional helpful links. Update (04/28/09): Mashable's article "Should Your Company Have a Social Media Policy?" - The five W's to adopting a social media policy. Update (06/08/09): Mashable's article "10 Must-Haves for Your Social Media Policy" - What every social media policy should contain. Great article for those just getting started. So, do you have social media guidelines at your company? What is your opinion of how a company should set policies on social media use? Does it frustrate you that you have to second guess your actions on Facebook, etc. because your employer is 'watching'? FYI, I figured out how to have christyweb.com redirect to www.christyweb.com. So now you should be able to use my Web address minus the 'www' to get to my site. Also, FYI, christyseason.com also redirects here. NxD album postponed! :( Boo! So, I hate I had to read this on perezhilton.com, but No Doubt is postponing their new album -- which makes sense I guess considering that Gwen just had her second baby, but I can't help but still be disappointed and sad. :( For those of you who know me, I've been a huge fan of No Doubt since I was 15. Tragic Kingdom helped me get through high school, and you can still find my interpretation of Return of Saturn from 2000 if you Google my name. I've been to three of their concerts -- once driving five hours (from Clemson to Myrtle Beach) after taking an 8am final exam, to come back the next day and take another final exam. Another concert I dyed my hair hot pink for (yikes), and waited two hours after that concert to finally meet them. And most recently I was fifth row for Gwen's concert in Charlotte in which I held up a homemade sign, "I can't wait for No Doubt's new album". Gwen saw the sign, pointed and waved! (swoon) So, I'm sad that I will have to wait yet another year for No Doubt to come out with another album. I'm not a big fan of Michelle Obama, but I am a big fan of fashion, and more specifically, dresses! So, my sister emailed me this link to a slide show of designs by famous designers of what Michelle and her daughters should wear on inauguration. Some of the designs make her look downright scary, while others make her look like an African American Jackie O. Some designs are ridiculous and flashy, and others I'm left wondering 'huh?'. 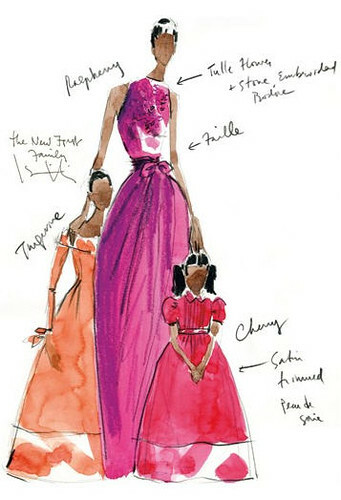 But my favorite of the bunch is actually the very first design by Isaac Mizraahi which features a pretty color palette and conservative dresses for an event that should be conservative -- well in dress anyways. Click on the photo of my favorite design below to view the entire slide show of designs. Leave a comment and let me know which one is your favorite. Lilly Allen's new album comes out soon!